Blue Apron is all about convenience. From perfectly portioned, handpicked ingredients delivered to your doorstep to recipes suitable for beginners and experienced home chefs alike, everything is designed to increase your satisfaction and allow you to relax and actually have fun in the kitchen. 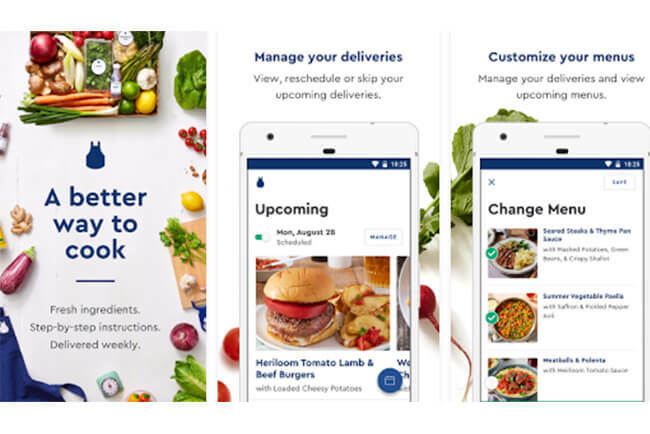 With the goal of making the ordering and cooking processes even more enjoyable, Blue Apron has designed mobile apps for Android and iOS. Let’s find out more about their features and discover how useful they can be. With Blue Apron apps, you can modify your orders, view upcoming recipes, choose the ones you want to try out next, and handle everything related to your account wherever you are. You can skip a week, make last minute changes, and maybe even get a couple of bottles of fine wine to go with your meals. Everything you want to do or view, you can access via your phone in just a couple of taps. Once you install the Blue Apron app, you gain access to tons of helpful tips and techniques that can help you become a master in the kitchen and get perfect results every time. Not only that, but you can expand your knowledge by watching pro chefs at work. The excellent how-to videos can help you learn all the key skills, from chopping scallions to grilling a perfect steak. Not only do you get to view the recipes for the current week and the ones to come, but you also get to freely browse Blue Apron’s cookbook with more than 1,400 amazing recipes. Whenever you are having trouble figuring out what to cook next, you can browse the recipes by season, main ingredient or cuisine and easily find the recipe that suits your cravings. Once you come across a recipe you particularly like, you can add it to your favorites, so you can revisit it whenever you wish. 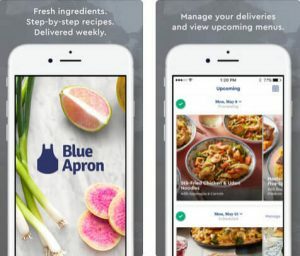 Both Android and iOS Blue Apron apps can be used free of charge, so you can enjoy the perks of having all of the options and content listed above right at your fingertips at all times.